The quiet and serene surroundings of Chokkahalli, 7km from Kolar, appealed to Swami Brahmananda, who approved of this perfect location for Sandeepany Karnataka in 1984. In 1993, during Pujya Gurudev's visit to Bangalore for a Geeta Jnana Yajna, Sri Shadakshari undertook the responsibility of building a big temple for Sri Omkareshwara. The Kumbhabhishekam took place on the 19th & 20th of November 1994. On the 19th a Rudra Homa was performed according to tradition. 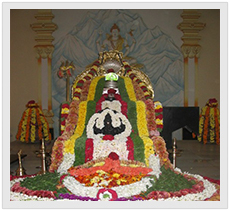 A Sahasra Kumbhabhishekam was performed on the 20th with nearly 3500 people participating on that day. The temple has Lord Shiva engraved amidst Kailash. An idol of Lord Ganapati occupies the position below Sri Omkareshwara. There are two bulls in front of the temple. 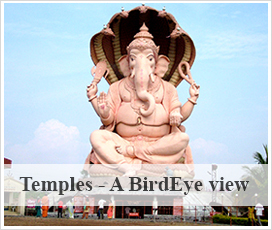 The crown of the temple is adorned with the carvings of Sri Dakshinamurthy, Lord Ganesha and Lord Kartikeya. On top of the temple is a huge Shiva Linga.